Last US Navy Ship sunk? Topic: Last US Navy Ship sunk? My Blue & Gold officer (interviewer for the Naval Academy) challenged me to find out which ship was the last US Navy ship to be sunk in battle. I've searched all over, but I'm stumped. Any of you guys have an idea? So looking at the list, http://www.history.navy.mil/faqs/faq82-4.htm I'd day its the USS Sarsi (ATF-111) sunk after striking a mine at Hungnam, North Korea, 2 killed, 27 August 1952. But your guess is as good as mine. Hehe you beat me by 11 minutes. Same web site and all. What's that some say about minds and thinking alike? Myself, wishing to stay modest and humble, I will allow another Poster to answer, and thus have the mantle of greatness thrust upon me from afar. Well from the last memo I got the story was that great minds think alike however there an equal number who would say that fools never differ and I am prepared to bet that if put to a vote there would be a predictable outcome and not necessarily a flattering one. However back on track, this is a rather tricky question as hitting a mine may not be what this guy is thinking of when he talks of "being lost in battle" and if that is the case then we would probably have to go back to the USS Indianapolis sinking or USS Bullhead of WW2. Getting sunk by a Mine is sort of like getting sunk by a Sub in my opinion, so if it is Ship to Ship battle, I'd just have the other one at the ready. There were Boats lost in Vietnam, no Ships as far as I know. Navy people tell me the way to tell the difference between a Boat and a Ship is Boats are carried by Ships. 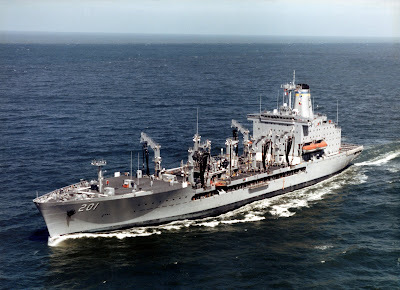 The USNS Patuxent, a Fleet Replentishment Oiler of the Henry J. Kaiser class, was lost at sea this morning, CNN has learned. The Patuxent carried a crew of 104, but there has been no report on the number of casulaties. the Patuxent is still on the Navy Lists- the story is a mock up and carries the following note. CNN Warning! This is part of a foreign policy simulation. The events depicted may not actually be happening. Not due to hostile action, but rather an accident: USS Frank Evans (destroyer) sunk in 1969 after being struck broadside by Australian aircraft carrier HMAS Melbourne. The ships were involved in joint exercises.